Edinburgh conceded two tries in the final 20 minutes as Zebre ended a run of four defeats to move up to 10th in the Pro12 table. A Roddy Grant try helped the visitors to a 7-3 interval lead and a Tom Heathcote penalty extended their advantage early in the second half. But, having recovered from three yellow cards, Zebre replied with tries from Giulio Bisegni and Michele Visentin. The second score was awarded after a long wait for TV replays. It was just a second win of the season for the Parma-based side, while Edinburgh slumped to a fifth defeat from their nine outings. Kelly Haimona's penalty, which hit the post on its way over, gave the hosts a 10th-minute lead. Heathcote missed the chance to level but Alan Solomons' side managed to build a head of steam, with Valerio Bernabo in the sin-bin. The breakthrough came shortly before the break, with Grant ploughing over and Heathcote was successful with the conversion. Edinburgh threatened another score early in the second half, with winger Dougie Fife stopped just short of the line. And Heathcote knocked over a penalty after Hennie Daniller was shown a yellow card by referee David Wilkinson. Repeated infringements at the scrum then saw a player from each side sent to cool off, with Rory Sutherland joining Zebre's Dario Chistolin on the sidelines. Haimona reduced the deficit with a penalty before the Italians moved in front with an impressive counter-attack. WP Nel fumbled to send the hosts rushing forward and centre Bisegni finished a slick move off under the posts, with Haimona converting. The home side had their tails up and replacement centre Visentin completed the scoring as he bundled over in the corner while Haimona missed the extras as Edinburgh lost for the third consecutive game to Italian opposition. Zebre: Hendrik Daniller, Leonardo Sarto, Giulio Bisegni, Matteo Pratichetti, Giulio Toniolatti, Kelly Haimona, Brendon Leonard, Samuela Vunisa, Filippo Cristiano, Valerio Bernabò, Marco Bortolami (capt), George Biagi, Dario Chistolini, Andrea Manici, Andrea Lovotti. Replacements: Oliviero Fabiani, Andrea De Marchi, Lorenzo Romano / Luca Redolfini, Quintin Geldenhuys, Andries Van Schalkwyk / Jacopo Sarto, Guglielmo Palazzani, Luciano Orquera, Michele Visentin / Giovanbattista Venditti. 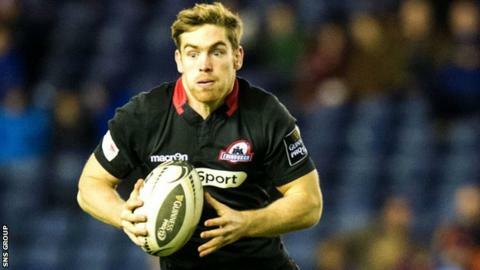 Edinburgh: Nick McLennan, Dougie Fife, Matt Scott, Andries Strauss, Tim Visser, Tom Heathcote, Sam Hidalgo-Clyne; Rory Sutherland, Ross Ford, Willem Nel, Ollie Atkins, Ben Toolis, Mike Coman (capt), Roddy Grant, Dave Denton. Replacements: James Hilterbrand, Grant Shiells, John Andress, Fraser McKenzie, Tomas Leonardi, Grayson, Hart, Greig Tonks, Sam Beard.